I went to the dentist and had my teeth cleaned. I do so twice a year, or once every six months. I brush my teeth several times a day, in the morning, after each meal and before going to bed. Now. Let’s look at the difference between cleaning your teeth and having your teeth cleaned. 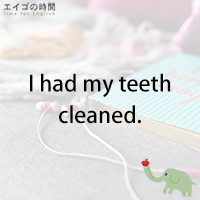 When you clean your teeth, you clean them yourself, using a toothbrush, toothpaste, maybe dental floss, too. On the other hand, when you have your teeth cleaned, you go to the dentist and a hygienist will clean your teeth, scaling and polishing to remove tartar. Likewise, when you fix something, you fix it yourself. When you have it fixed, someone else fixes it for you. When you cut your hair, you need a pair of scissors. When you have your hair cut, you go to the hair salon. I had my teeth cleaned. Next Post すごい！ – Wicked good!